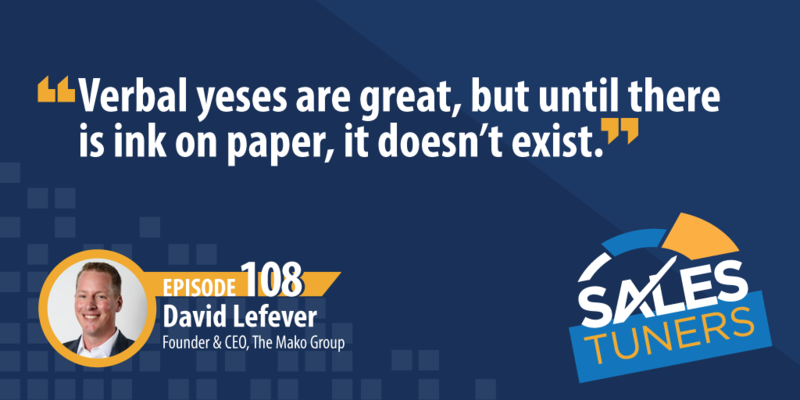 David Lefever (@DLefeverTMG) is the Founder and CEO of The Mako Group, a company specialized in security audits and assessments. David focuses his efforts on reducing risk and exposure for healthcare, banking, and publicly traded companies. When he’s not busy growing his company, he’s spending time with his family. David’s entrepreneurial sales story started from zero. Despite having limited connections, he knew failure wasn’t an option. He had a family to feed. So, he reached out to everyone he could think of in an attempt to drum up business. Luckily, with a relatively new service and little competition, he succeeded in landing some local clients, who served as a launchpad for his business. He credits his start-up success to the power of a hunters mentality and having the right attitude when it comes to hearing the word “no”. With the right mindset, every “no” you get can be seen as a success. Not only do they teach you valuable lessons about what doesn’t work, but each “no” is one step closer to the next “yes”. Prove the Concept: If you’re rolling out a new product or service you know can solve a problem, but no one can vouch for it, consider giving it away to seed the market. Think about the last time you were in the food court at a mall. Several of the restaurants had a person standing outside their area handing out free samples. After trying a small nibble of something good, you proceed to pay full price for the product. The same is true with pilots and limited engagements of your service. Getting companies to put their name on the line early allows them to be references for you as you expand. Let Tenure Help You: Going against the trend of sales reps bouncing from company to company every year and a half for a 10% raise in base salary, I want to encourage you to find a good company and stay put. I have several friends and clients who have W-2 earnings of over $1-million per year. I’m not exaggerating. These individuals have been with their respective companies for 5-10 years and have seen some of their buyers move to two or even three different companies, each time immediately bringing their salesperson into their new role. Think about that — this is much better than your regular inbound lead, this is someone who has actually bought from you and seen success. Additionally, the notion of survivorship bias starts to creep in. The company you’re with knows you know more about the product than anyone else, so they trust you to work on the largest opportunities. Verbal Yeses are Garbage: Look, I love Ruth’s Chris steaks, but not once have I ever been able to pay for one with the commission check from a verbal yes. I see and hear so many reps getting “happy ears” about some prospect giving them a verbal yes and then being absolutely shocked when two months go by and either the deal is still not closed or they find out they went with another solution. Until you have dry ink on a piece of paper, you’ve got nothing. Start thinking through every possible scenario that could cause your opportunity not to close and then work diligently to line up the resources needed to overcome each and every one.